This reserve is on the Exe Estuary and during this time of year is the wintering grounds for some twenty thousand waders and wildfowl, we arrived on the high tide which gave us the best chance of seeing as many species as posable as these birds are driven of the mudflats of the estuary by the tide to rest and preen waiting for the water to recede. We then returned to Darts farm for lunch. UTLSC Dartmoor Walk – Three Tors Plus One and back again…. We gathered at our base camp, aka Okehampton Station Café, where we stocked up on tea and coffee. Once every one was refreshed and conveniently relieved, we ascended the foot hills of Dartmoor, by car! to our start point. On a lovely clear sunny day, with a very light wind and a pleasant temperature, we began our ascent. Starting steadily along artillery ring road, taking in the vast expanse of moorland, pausing to view Irishmans Wall on Belstone Ridge, Steeperton Tor and Hangingstone Hill in the distance. Stopping to investigate a boundary stone for the parishes of Okehampton and Bridestowe. We continued along the gradual climbing rocky track, absorbing the peace and tranquil space surrounding us as far as the eye can see, so rarely found in this modern world. The landscape levelled out as we reached the top plateau between High Willhays, the highest point on Dartmoor and Yes Tor. Maisy the chocolate Labrador explored the rocky promontories, eventually conquering High Willhays, with her human companions. We sat for a while and enjoyed the panorama in warm sunshine, as a steady and progressive but not unpleasant invasion of multi spotted ladybirds took up temporary residence on each of us. There is a manmade cairn between the two tors, which was the subject of some debate later as to its existence being in conflict with the landscape. We then rambled across to Yes Tor for our picnic lunch. Our return journey, took us to the south of West Mill Tor, with a detour to investigate the remains of the military moving target narrow gauge railway loop and stone bunker housing the locomotive. The rusting rails gradually being reclaimed by the moor. Then on past Row Tor and our return to the carpark, where a discussion was had as to the distance covered, recorded by various GPS devices. The OS map said approx. 6 statute miles. To complete the day we all returned to the Station Café for well earned refreshments. Many thanks to everyone for sharing such a lovely day with us. They each set off for different start points with pens and clues at the ready. Some took a more leisurely approach and stopped to look around the castle or a coffee break while others returned to Crooklets more directly. The clues were spread around the canal, castle and high street so they had not far to go but some clues were quite tricky to solve. They all found out who done it and with what in about 2 hours. The weather was dry if a bit cold but the waves were not inviting so after a picnic lunch we had a game of crazy boules before a cream tea on the terrace. An enjoyable and not too strenuous day. Sadly no photos. We were too busy enjoying ourselves. and Janosh with his brother and mum Nedua. Club members enjoyed a BBQ and chat after rowing along Bude Canal. As this is now the 4th year that we have held this event, it is clearly becoming a firm annual fixture for those of us that enjoy a change from our more usual race events. For this to be a success, we need the following ingredients as a minimum: good company, good sailing weather, good camping weather and sufficient boats to match the sailors. Luck was with us on all of these. Club boats Rob Eason Bosun and the Kestel, and the Pollard’s Bosun were imported from Cornwall on the Thursday evening with their respective masts raised on Friday morning. John Dabbs’ Lugger Lisca, John Buckett’s Falmouth Bass and new member’s Geoff Provis, Falmouth Bass boats were already resident at Roadford Lake. These six boats proved to have ample capacity to provide sailing opportunities for the 18 members that announced their arrival on Friday. The available boats were supplemented with the arrival of James Pollard on Saturday, towing Roger Heasman’s Blaze (soon to transfer ownership to James). The Saturday sailing numbers had reduced to 14, so the services of John D’s Lugger and John B’s Bass boats were not now required. Weather forecasts for the weekend indicated that we could expect dry and warm days with a small risk of short but sharp rain showers. Wind-wise, one site suggested an interesting wind forecast: “a wind speed of 5 mph, gusting to 3mph”! This would be quite acceptable for camping, but not for our active sailors. In the event, the very real threat of rain on Thursday evening didn’t materialise; and for the next 2 days, there was absolute stillness on the water until mid-morning, with a gentle breeze subsequently building up to a useful sailing wind all afternoon. Our Friday sail started with a familiarisation sail around some of the lake starting late morning, then a procession to the Lake Cafeteria led by John D’s Lisca for refreshments, followed by pleasant afternoon sails, exploring some of the inlets around the lake and comparing the performances of the varied boat types. 19 of us then moved on The Clovelly Inn, Bratton Clovelly for our evening meal which was eaten amongst convivial and lively conversation. On Saturday, we shared the lake with a rally organised by the Classic & Vintage Racing Dinghy Association. They were running a series of 3 back-to-back races, starting late morning. This produced an interesting mix of classic racing boats, most in superb condition which was a joy to see. Their race course took up most of the centre section of the lake so, to avoid interfering with their sailing, most of our boats stayed in the northern section of the lake where we still had plenty of space to play in. We had planned on using the SWLT barbeque area for our Saturday evening barbeque. Unfortunately, this whole area had been booked by the C&VRDA. So we moved on to Plan B: cook our evening meals in the evening sunshine on a communal collection of our camp cookers, mainly assembled around the Pollard’s campervan. A pleasant evening. I would be grateful if members would provide some feedback to the Committee so we can incorporate new ideas if we are to arrange a similar event next year. Does a mermaid need a diving helmet? Many thanks to Geoff for organising another visit to Skern Lodge, this time in sunshine. We met about 1.30 and got kitted out to go kayaking along the Torridge. John Savage, Karen and Joe elected for single kayaks while Geoff & Sally, Linda & Robin and Penny & Annie decided to test their friendships by sharing kayaks. Joe & Annie went for a dip to cool down before we got started. We paddled gently up river from Appledore with the tide towards Bideford. On the way we passed the Irish Naval Service Offshore Patrol Vessel P65. Our instructor pointed out that the captain was on board as she was flying a flag. He was also very knowledgeable about Viking history along this part of the river. I’m sad to say I have forgotten all he told us! Joe was the only brave one among us to try using his kayak as a paddle board. He looked a little hot so I tried to cool him down with a few splashes. He felt that was insufficient and decided to jump in the river. None of us joined him. As we paddled under Torridge bridge we watched a bird of prey (some may remember what it was) resting on the top of the supports under the road. There is also a painting of a mermaid at the base of the bridge which none of us had seen before. We were delighted to find that we did not have to paddle back against wind and tide. Skern Lodge had arranged for the transport to meet us at Bideford. Another great UTLSC social event. Some sixty ordinary land-living folk of all ages, sizes and sexes were given a taste of the (not very) high seas on Saturday 12th May as part of The RYA’s Push-the-Boat-Out-Day. A good time was had by all. 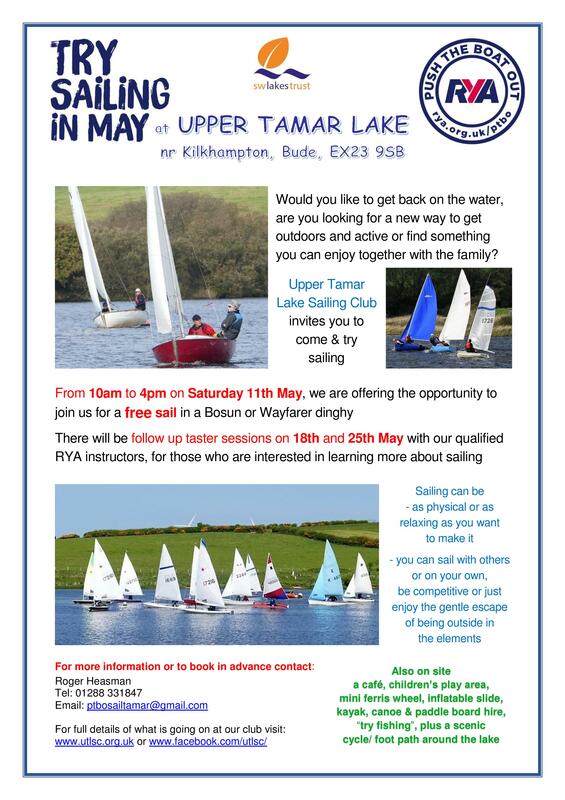 As can be seen from the photos below, the people who got out on the water seemed to be having a great time – and some of them were sufficiently interested in the sailing experience that they subsequently signed up for the sailing taster sessions being organised by the club. Feedback on the club side was that the admin side of things worked much better this year, which made it a far more satisfying experience for all involved. As always, very many thanks to all club members who helped out to make the day such a success, both on the water and behind the scenes. I put on my suncream and hat and wandered over to Rosies cafe for lunch looking forward to a hot sunny afternoon of croquet. After a very pleasant lunch we exited to be met with thick sea mist which was VERY cold. Luckily we could still see the croquet ground – so we made our way there to be met by several very welcoming Croquet Club members. They introduced themselves to us and us to the equipment. Several minutes of practise followed with quite a bit of laughter – it’s a bit harder than it looks. We were then divided up into 4 groups to play matches. 2 against 2 – some husbands and wives playing together and some against each other. There was much hilarity as people attempted to get in their opponents way with unintended consequences. There was some amazing shots – through hoops from a distance or in off when trying something else – luck or skill? Everyone was far too cold to stay after the first round of matches, which was sad as the Croquet Club had provided cold drinks and cake. Several people are interested in playing again. It would be good to give it another try – when it is warm and sunny or we have warmer clothing. Ten humans and one dog met just north of Croyde. Having suffered a couple of chilly sea mist days on the coast it was wonderful to see and feel the sun on our backs and sparkling on the sea. There was black wooly sheep with young lambs grazing on the cliffs as we walked out along towards Baggy Point. We were about to turn inland when some rogue members decided to walk to the pointy bit. Sadly no seals were spotted but there was some discussion about the starboard buoy off the end, was it really part of the buoyage for the Bristol Channel? We continued along the cliffs admiring the late spring flowers and sniffing the coconut smelling gorse until we stood looking down across Morte bay. Dave mentioned that as a child he had lived nearby and walked along the beach from Putsborough to Woolacombe to get chips. Geoff and Denise had had their wedding reception at a hotel in Putsborough which was the last event before it had closed to become a very smart set of flats. What wonderful memories to a fantastic view. We walked down to the beach to have our picnic. It was beautiful and warm. Kids were playing in the rock pools, several people were surfing and some were even swimming without wetsuits. So we decided to take a paddle. The water was very cold. After lunch we walked back across the ridge enjoying looking at tasty looking lambs and alarming a few sky larks. We followed a path between the fields until we arrived back in Croyde and enjoyed a visit to the tea rooms before returning home. Many thanks to Jane for a lovely day. A large crowd of club sailors gathered in the Grenville Rooms at Kilkhampton for a long-awaited (the first date had to be postponed because of worries about the weather when driving home) talk by Paul Anderson on the highlights of his long seafaring career as an officer and captain on oil tankers. Paul’s talk was illustrated by a highly impressive collection of slides, which gave a good insight into what life was like on board a supertanker, as well as an overview of some of the places visited. Perhaps the highlight of the talk was Paul’s moving account of a rescue at sea, in which all but one of the crew of a sinking ship were saved. The sheer scale of the tankers on which Paul sailed was sometimes hard to grasp, especially as they increased vastly in size during his long career – trying to imagine them floating on Upper Tamar (they wouldn’t) was an interesting exercise; Paul’s title for the talk of ‘Mine’s Bigger Than Yours’ was in this case definitely an understatement. Prior to the talk, Nicky Buckett went into chef mode and provided a cooked meal (a choice of lasagne or vegetarian shepard’s pie) for the assembled throng – quite an achievement because of the numbers involved, but made a bit easier by the Grenville Room’s amazingly well-equipped kitchen, with four ovens and a commercial-speed (3 minute!) dishwasher. Many thanks to Paul and Nicky and also for the extra help from Linda and Robin Spiller; thanks also to Mandy for the photos. A big thank you to everyone who turned up at Launcells Parish Hall, Grimscott, on such a chilly evening to enjoy a social game of skittles and a bring a share supper. We ended up splitting everyone into 3 teams of 6 players. The group included club members such as Brian, Adam and Ruth, seasoned players from local skittle leagues (who all bowled with aplomb), whilst others of us set our sights rather lower. The picking of the teams was obviously done with some skill, because it was a closely contested match, with not much difference in the final scores. At the end of the evening the winning team of Geoff and Joe Floyd, Cilla, Sue, Brian and Nathan scored 262 points with the remaining two teams both scoring 235. Each winning team member went home with a small prize, with Robin taking the Easter Egg home for the highest score of 58, with Brian scoring 55 and Nathan scoring 51. Ten intrepid Sailing Club members (excluding the addition of the author), took part in Meddons monthly Wine and Wisdom Quiz Night on Friday January 26th. As is usual at the quiz, there was a pretty competitive spirit and a lot of friendly banter going on. This was heightened by the fact that the Club had enough for one team of the maximum number of 8 people, which meant that three club members joined another team who were short on members and so were in opposition. It seemed from comments received, that club members enjoyed their evening and Meddon have offered that the club are welcome to send a team every month. Jenny Dabbs and Sue Murray both came out as winners in the playing card bingo whilst the ‘In Opposition Team’ managed to share the winners spoils with two of the resident teams. My personal thanks to everybody who came and for flying the club flag so well.